Find out why guest posting is such an effective SEO strategy. 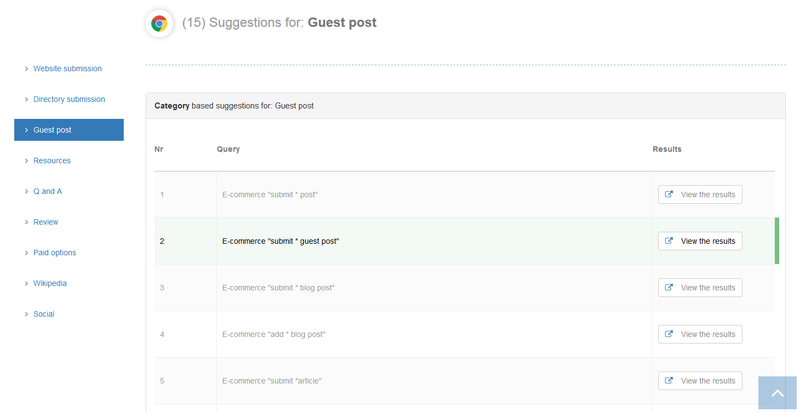 Learn how to quickly identify guest posting opportunities. How to write an guest blog / post that will get published. An overview of tools to speed up the guest posting process. A guest post is an article you write as a “guest” author for a website that is not your own. Many blogs offer guest post submissions to get fresh and interesting content. By writing a guest post you can display your knowledge and expertise to a new audience and get more online exposure. What makes Guest posting an effective SEO strategy? Generate relevant and high authoritative backlinks to your website. Display your expertise and connect with new readers. Get referral traffic from you guest post. In many cases the blog you’re writing for, has more ranking potential than your own website. So use this effectively to maximum results from your guest post. The first 3 points are pretty self explaining, but the last point might need some additional background information. I’m assuming you’re targeting high quality websites where you’re going to submit your guest post. This means this website also has a better chance of ranking for competitive search queries. How to Find guest posting sites? When you need something it’s always a little bit less scary to begin with the people you already know. You probably have your favourite blogs you are reading, right? So start with these and find out if they accept guest posts. You’re reading these blogs because they interest you… This also means there is a pretty big chance you can contribute with an interesting article. Or use my link building tool to get these queries generated automatically for you. Tip: be sure to start with general keywords related to your topic / theme, because otherwise you might be limiting the opportunities that Google will return. Once you’ve found some great guest posting websites, use the query: related:domain-name.com to find related websites that might offer guest post options to expand your list. How to qualify the guest post sites you find? Create a list in excel or Google spreadsheets to get a nice overview of the guest post opportunities you’ve found. Use the bulk domain authority (DA) checker to get the current domain authority for the blogs your going to target. Filtering your list based on DA can help you prioritize and do your outreach more efficient. Go to: Bulk domain authority (DA) checker to create your list. Another great way to determine the potential value of a blog is looking at the traffic statistics. Using SEMrush you get a pretty decent indicator of the total traffic (including organic, paid and social traffic) a site is receiving over time. To write a great guest post you need to be sure you know what you’re going to write about and be prepared to put in the work. To maximize the return of your efforts you need to aim high. To really make an impact you need quality websites and these will only allow quality content to be published. To improve your chances of being published you can reach out to the editorial team of a blog to find out if there are specific topics they would like you to write about. This knowledge will dramatically improve your placement success rate. Promote your post on social media to get maximum exposure. React to comments as soon as possible, because a fast response time can get a active discussion going. Send a thank you mail to the editorial team and possible connect with your contact on social media, so it’s easy to reach out again in the future. If possible, write about stuff you’re passionate about. Aim high, it doesn’t really pay-off to write for low quality sites. Read the website specific submission guide lines, before you start writing your entry. Take the time to produce quality content to improve the chances of your guest post being published. Don’t submit articles which have been published before online. In most cases this is not appreciated. Don’t try to cut corners, just put in the work and produce something interesting. Don’t get carried away when it comes to adding links to your post. Only include links to your site when relevant. Be very careful when it comes to writing about company related stuff in a guest post. In most cases this type of information isn’t really interesting that relevant. Broken backlink checker – Find broken backlinks pointing to your website. SEMrush Traffic data – See how well a website is performing online and compare multiple sites / Competitors.